A sudden, violent car accident can change or end a life, or lives, in a matter of moments. If your life took a different turn, or a loved one was killed in a motor vehicle accident with a car, truck or motorcycle, you have rights that must be protected. 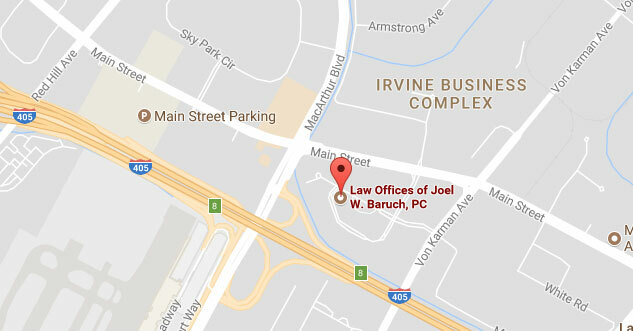 At the Law Offices of Joel W. Baruch, P.C., our attorneys protect those rights — for seriously injured persons just like you — every day. Our car accident lawyers work hard to achieve justice for motorists and passengers facing uphill struggles after an accident. In every personal injury claim we handle, we investigate, negotiate and litigate aggressively to recover clients’ lost wages, medical bills and vehicle replacement costs. We also clearly recognize victims’ pain and suffering of recovery, and emotional trauma that could linger for years. Don’t let the smile fool you. Joel W. Baruch is tough, aggressive — and has a high win rate in more than 200 trials. Drivers of conventional motor vehicles are no match for the speed and power of commercial vehicles, such as 18-wheelers and semi tractor-trailers, when a collision occurs on a busy Southern California highway. Our Orange County law firm aggressively advocates for the freedoms, finances and futures of clients injured in accidents with “big rigs,” distracted and drunk drivers, as well as uninsured and underinsured drivers. We hold insurance companies accountable for the negligence of their insured when laws are broken and lives are destroyed and lost. Were you or a loved one paralyzed by a brain or spinal cord injury in a car accident? Are you mourning the loss of a relative because of the thoughtlessness of a careless driver? Ensure that your interests are safeguarded by contacting us. The contingency fee policy at our firm means that you owe no attorney fee unless we win your case. Call 949-864-9662 to arrange your free initial consultation. If your injuries prevent you from coming to us, we can come to you. Spanish language access is available upon request.